Ananka's Diary: What a Week: Tiny Frogs, Mysterious Blobs, and a Rat-Eating Plant! What a Week: Tiny Frogs, Mysterious Blobs, and a Rat-Eating Plant! It's been a banner week for the bizarre! A teenager used a camera to snap a picture of a group of friends and captured a ghostly face peeking out at him. A British famer built a castle on his land and hid it from authorities for four years. A mysterious "doughy" blob has clogged a sewer in Maine. A rat-eating plant was discovered in Australia. A Brooklyn mom found a tiny, live frog tucked inside a head of lettuce that she'd kept in the refrigerator for days. **first comment I hope** Cool frog. The picture thing freaks me out... stuff like that always does. I liked the frog in lettuce the best! SOOO cute! So what do you think? Real, fake, a rock? the frog is so cute! Wow. A little scary, but as always, really cool! Yikes...the ghost pic is freaky! I know about Japanese giant salamanders from a show called "Almighty Amphibians" that they play every so often on the animal channel. The Japanese ones are dark brown colored and shaped differently from that Chinese one. People in Japan thought their giants might have been created by radiation, but i guess that's not so if there's a similar species in China. *grin* it's so cute on the show, these Japanese guys saying they think their salamanders are "kawaii." Cute lil' frog!!! HE'S SO CUTE! And, rat-eating pitcher plants eh? Well, the plants are having their first major evolution...called...carnivoring-es-s....thing. When is the next Kiki Strike coming out? ^^ And will there be any more male characters in it? xD Sorry - just a wee bit of an obsession. Yesterday was free-hugs day at my school. 60s, much? I want the frog, but my parents probably wouldn't let me keep it. Are they claiming that the face in the picure is any deceased, famous, or religious figure? You know, like the lady who said she saw the Virgin Mary in a grilled cheese sandwich? Why didn't they just go in there with shovels and scoop the blob out? I don't know Hazel, they're just really stupid! LOL. Check it out, and find out what the Salami Dragons are! The Frog is super cute, at my old house we used to find ones clinging to the windos that were even smaller. The ghost face is really creepy, espcially with the little girl crying. Isnt it said that the younger you are the more perceptive to things like that you are (if the pictures real and not photoshopped. And the Slamander is just.....eeeurgh. She loved church and eating grilled cheese so much, that she saw the Virgin mary in her sandwich. Elizabeth: You should totally gat a blog to put all of that cool stuff on! Thanks, but I don't know how. Elizabeth: Perhaps you would you like to be an Intrepid Girl Reporter for this blog? Raph: Not sure EXACTLY when the next one will be out, but I'll make sure you're one of the first to see it. And yes, I there will even more boys than in #2! IM: How exactly does "free hugs" work. Do you have to hug people you don't like? Spring: How on earth did you come up with a name like "Salami Dragons?" And did you draw the pic on the blog? It's great! Really? An Intrepid Girl Reporter? Cool! What's an Intrepid Girl Reporter? And I just realized something: isn't Kiki short for Kirsten? Did you name her after yourself? And Elizabeth, if you go up to the top of any blog, there's a little button called Make A Blog or something like that. Elizabeth: If you found weird things that you wanted to tell people about, you could write something up and we could post them here under your name (or alias). "Intrepid Girl Reporter" was the nickname of Nellie Bly--look her up. She was pretty interesting. oooooooh.....i like the blob in the sewers. Where do you find all of this trivia, Kisten? The lettuce one is so cute! 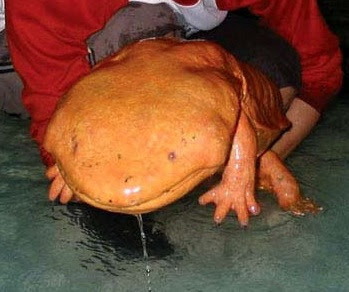 I thought the salamander was freaky though.